"Obviously, we intend to fight vigorously against these charges"
Lamb Of God manager Larry Mazer has issued a statement following the news that the State Attorney's Office in Prague, Czech Republic, has officially indicted Lamb Of God vocalist Randy Blythe on a manslaughter charge in connection with the 2010 death of fan, Daniel Nosek, who succumbed to injuries due to an on-stage following an apparent stage fall while attending a concert by the band. If convicted, Blythe faces a possible five to 10 years in prison. The singer, who spent five weeks in a Czech Republic jail earlier this year, has said that he would return to Eastern Europe to face a trial. 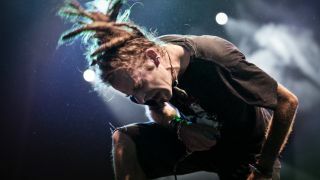 "After a three month investigation, the prosecutor in the Czech Republic has decided to move forward with an indictment of Randy Blythe on the charge of manslaughter with intent to cause bodily harm. Obviously, we intend to fight vigorously against these charges as we feel that in no way did Randy intend to cause bodily harm on the young fan who subsequently died from injuries sustained at the show. As he has stated previously, Randy intends to go to Prague to defend himself at trial. "While it is a tragedy that a Lamb of God fan died following a performance by the group, in no way do I feel that Randy did anything improper that led to the young man's injuries and subsequent death. The price of a ticket to a show does not entitle audience members access to a band's stage. In the years since the murder on stage of Dimebag Darrell Abbot, performers of all genres have had to become more guarded while performing in response to the dangers presented by fans trying to become part of the performance. "We believe that Randy responded professionally to the numerous amount of fans rushing the stage that day, a number of them captured on videos that have been posted on the internet. We have testimony from the venue operator that acknowledges lax security and an improper barricade being used that evening. Numerous testimonies from fans also were contradictory as to the actions of the multiple fans that tried to access the stage. "At this point, all that the band, myself, and our lawyers can do is to present a defense and try to convince the panel of judges who will hear the case that Randy is innocent of all charges and that his name and reputation need to be cleared and that he be permitted to carry on with his life and career always mindful that a fan passed away after a Lamb of God performance."